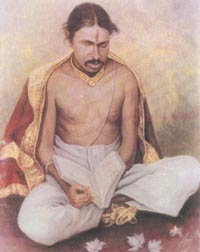 Sant Gulabrao Maharaj was known as Pradnyachakshu Madhuradwaitacharya Gulabrao Maharaj. He was called Pradnyachakshu because he became blind of both the eyes at the age of about 9 months; still he was master of Vedanta philosophy and many occult and physical sciences. ‘Padnya’ means intelligence and eyes are called “chakshu” in Sanskrit language. He had many divine powers which included the ‘intellectual eyesight’. His mind could read and grasp any book in the world in any language that he would take in hand and decide to learn. His mind did not need the body-organ like ‘eye’ to see the world. “Madhuradwait” was the new school of thought introduced by him. The people well versed in Vedanta know that ‘adwaita’ (non-dualism) philosophy of Vedanta do not accept any name and form visible or non-visible that could be different from God (soul, Atma or Brahma). Vedanta very explicitly proclaims, “When everything has become one-soul, where is any other thing to smell ? who will see whom ? who will listen to whom ? who will talk to whom ? where is any other thing to think about ? who will know whom ? How to know him who knows everything ?” (Asy sarva atmaivabhuta, tat ken kam jighnet ? , tat ken kam pashyet ?.. ……… brihadaranyaka). “What exists is only one thing i.e. Brahma and what we see and experience as world is illusionary” is the teachings of “adwaita”. Madhura Bhakti is the devotional love for lord Krishna. In Vedanta all the three words viz. devotee, devotion and deity are not different from each other where as in Madhura Bhakti one has to be a deity and other a devotee. Adwaita do not recognize Bhakti at all. Probably the great saint who possessed the eternal knowledge since childhood by dint of providence due to his past karma, had advocated Madhurabhakti for the “after-attaining-knowledge” stage to his disciple. His full name was Gulab Gundoji Mohod. He was born on July 6, 1881 in a small village named Madhan in Amravati district in Maharashtra and died merely at the age of 34 i.e. in the year 1915. Though he had lost his eyesight at the early age, he wrote about 133 books on various subjects containing more than 6000 pages, 130 commentaries and about 25,000 stanza in poetry. His mother died in the year 1885 when he was four years old. He then stayed at the house of his maternal grand mother at the place known as Loni Takli for about 6 years. In this period people came to know about his extra ordinary intelligence and his “brain-sight” though he had lost his eye-sight. There was a community well in front of the house where he stayed and the women from the village would come to well for water. Small Gulab would call them all by their names, and the women would be wonderstruck and would think as to how the blind boy came to know about their individual names ? He was found many times in deep samadhi stage in the night. Initially his grand mother and others were frightened to see Gulabrao sitting in Yoga position with is respiration stopped completely. However, some elderly and wise men understood the conditions of Gulabrao and asked his relatives to refrain from disturbing him during samadhi. He very much liked the holy songs(Bhajans), holy verses (Slokas) and reading the occult books. He would ask his friends to read the books and would repeat the contents immediately as was heard by him. He had extra ordinary memory. He knew all the Vedas and Shastras at the age of ten years. He was married to Mankarnika, daughter of Ganaji Bhuyar a farmer in nearby village in the year 1896. He started writing essays and poetry on the religious philosophy since 1897. i.e. from his age of sixteen. Since then he would visit the nearby cities, villages and towns and meet the people to discuss on the various topics of religion. This is incredible but true that in the year 1901 the great saint of 12th century Sant Dnyneshwar Maharaj met Gulabrao and accepted him as his disciple. Sant Gulabrao Maharaj would call himself to be a daughter of Sant Dnyneshwara and wife of Lord Krishna. He married to lord Krishna in the year 1905. He used to put on the dress and the ornaments like woman. He would lay kumkum ( a red spot) on his forehead and put on managalsutra ( a golden chain with black beads) around his neck which are usually worn by the Hindu married women. In the year 1902 when he was 21, he wrote the commentary on the theories of Darwin and Spencer. He had written books on various subjects like dhnyan, yoga and bhakti and written commentaries on ancient treatises. He wrote on the “Manas Ayurveda”, i.e. psychological part in the Ayurveda. He had given valuable guidelines to those who want to attain the salvation and gain the eternal knowledge. It is beyond one’s imagination that a blind man could write on the subjects like Yoga, Upanishads and Brahmasutras and many occult sciences which are difficult subjects to understand even by the highly educated and intelligent persons. When he found time to study these sciences ? How he received old treatises and from whom ? Who explained him the secret meanings of the Sanskrit verses ? Many questions like these arise in the mind when one reads his biography and the books written by him. His style of writing is of his own and he has put forth his own views absolutely keeping the Vedic discipline. He has boldly revealed many secrets of the Hindu religious sciences which are not generally made public by the saints. Though belonged to Sudra class (Kunabi Caste) most of his disciples were Brahmin Pundits. He was openly telling people that he had no right to study the Vedas according to old traditions, but he knew Vedas without studying them and since he knew the “Atmadhnyan” (knowledge of self-realization) he was not bound by many old rules. He used to respect Vedas, Brahmins and the guidance received from great wealth of old Indian religious treatises. He was straight forward and would defeat many Pundits and Intelligent people in the debate on the Shastras (sciences). It is generally found in India that the great persons who really had lived only for the cause of welfare of mankind were truly recognized by the people after their death only. Samartha Satguru Padnychakshu Madhuradwaitacharya Saint Gulabrao Maharaj is becoming more and more popular after his Samadhi on 20th September 1915. His many disciples attained the knowledge of self-realization and are known in the public as the great saints. His main disciple, Baba Maharaj Pundit (death 1964) who wrote many books was recognized as a great intellectual, and saint. His commentary on “Bhavartha Deepika” written by Dnyaneshwara Maharaj is published by Geeta Press, Gorakhpur. The great saints like Gulabrao Maharaj guide the people even after their death by volumes of knowledge written by them. Nice post on Sant Gulabrao Maharaj. sant Gulabrao maharajs temple in Chandur Bazar,dist Amravati,known as Bhaktidham,It has build up in 1987 by founder Mr. nanaji Ingole,he is a founder sansthapak of shree sant gulabrao maharaj,Bhaktidham,Chandur Bazar,Dist. Amravati,but in this site no mention about it,This sansthan pramote a gulabrao maharaj in maharastra as well as whole country,In bhaktidham so many programmes were conducted like Gita jayanti mahotsav in every Dec.,Paydal palkhi dindi from Chandur bazar to Pandharpur evry june in Ashadi ekadashi,Alandi palkhi in every Nov.in kartiki akadishi,Zhaneshkanya Vyakyanmala in every Feb.,He servive poor,anath,economicaly backward 25 studants in Gurukul ,so many activities are done in every year,but unfortunately,in your webside no mention about bhaktidham,chandur bazar,so I kindly request you please mention about it if you have any querry please contact to Bhaktidham Chandur Bazar on following address. I visited Bhaktidham in Chandur Bazar. To attend the aarti sung by little kids staying there is a heavenly experience. does anyone have any info about the saint whose samadhi is there in the courtyard of the temple?